Fritzi of Movies, Silently is hosting the SNOOPATHON running June 1, 2 and 3 which celebrates all things spy-related in classic film. Check out all the intrepid sneaks and the bloggers who love them. H.C. (Sapper) McNeile's "Bulldog" Drummond captured reader's imaginations with the release of the 1920 novel Bulldog Drummond. Captain Hugh Drummond has too much energy and moxie to adjust totally to post-war life and advertises his brawny and brainy skills as an adventurer. Adventures he has - and plenty! Romance he finds with Phyllis Clavering. Arch-enemies and stalwart pals populate Bulldog Drummond's universe whether it is a private mission or one for Mother England. Readers turned into playgoers and then film fans. Ian Hunter (The Adventures of Robin Hood) once played Drummond on stage. The first movies based on the stories were filmed as early as 1922 and 1925. In his first talkie, Ronald Colman was nominated for an Oscar as Bulldog Drummond in 1929. Eighteen-year-old Joan Bennett was his Phyllis. In 1934 British International Pictures released The Return of Bulldog Drummond starring Ralph Richardson and Ann Todd and 20th Century gave us Colman in Bulldog Drummond Strikes Back. Reginald Denny, John Howard, E.E. Clive, John Barrymore. A clue? Paramount's busy young leading man Ray Milland (The Lost Weekend, The Big Clock) starred in the January 1937 release of Bulldog Drummond Escapes. Hugh (the character never refers to himself as "Bulldog" nor do any of his friends) falls in love with damsel in distress Phyllis played by Heather Angel (Lifeboat, The Last of the Mohicans). Also in place are Hugh's Bertie Wooster-like pal Algy Longworth played by Reginald Denny (Rebecca, Private Lives) and the indispensable manservant Tenny played by E.E. Clive (The Invisible Man, Night Must Fall). Inspector Nielson of The Yard is played by Sir Guy Standing (Death Takes a Holiday). Over the next two years, seven movies would be made in the Bulldog Drummond series starring John Howard as Hugh. If you only know John Howard as the impatient younger brother of Ronald Colman in Lost Horizon or as stuffy George Kittredge in The Philadelphia Story you might look askance at the casting. No need to worry as John Howard brought a great sense of fun to the oft-times far out adventures, all the while maintaining an honest relationship with the other characters. Heather Angel and John Howard face danger. It may a contradiction in terms, but I find these movies to be the most "cozy" of thrillers. It is the relationship among the three main characters that gives the series that "family" feeling. Howard, Denny and Clive make a perfect team as the devil-may-care Hugh, the lovably buffoonish Algy and the ingenious Tenny. These actors are the constant among all of the titles. The role of Phyllis alternated between Heather Angel and Louise Campbell (The Star Maker). The gist of most of the movies was that just as Hugh and Phyllis are about to march down the aisle, there is a murder, a robbery, a murder and a robbery, or a mystery of national import requiring Hugh's undivided attention. Often times Phyllis is kidnapped. Often times Hugh and company underestimate Phyllis' resolve and usefulness. Frank Puglia in Bulldog Drummond's Revenge. Honest! Among the great character actors determined to keep Hugh a bachelor throughout the series are J. Carroll Naish, Frank Puglia, Porter Hall, Anthony Quinn and Eduardo Ciannelli. Elizabeth Patterson (Intruder in the Dust, Remember the Night) was featured as Phyllis' Aunt Blanche in three of the series titles and Zeffie Tilbury (The Grapes of Wrath, Werewolf of London) as Aunt Meg once and as different characters in two other outings. Nydia Westman (The Late George Apley, The Velvet Touch) was Algy's wife Gwen in two of the features before disappearing into the nursery to care for the couples' also never mentioned again child. The role of Colonel Nielson was played by John Barrymore (Counsellor at Law, Twentieth Century) in the series launch and for three of the movies in which he was top billed, Bulldog Drummond Comes Back, Bulldog Drummond's Revenge and Bulldog Drummond's Peril. H.B. 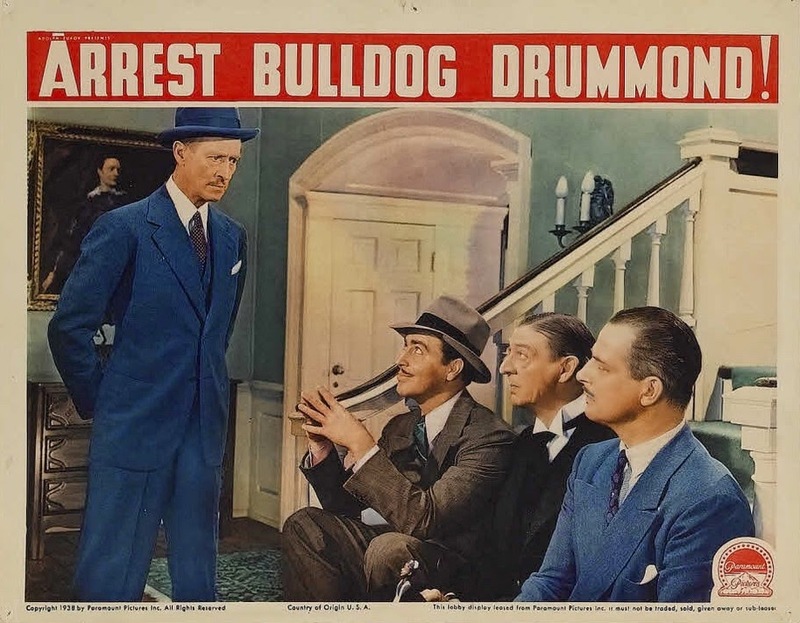 Warner (Lost Horizon, It's a Wonderful Life) took over the Nielson role in Bulldog Drummond in Africa and continued through Arrest Bulldog Drummond, Bulldog Drummond's Secret Police and Bulldog Drummond's Bride. Barrymore's Nielson was a master of disguise who dug right into the case at hand. Warner's Nielson was more of a fatherly desk jockey, but had moments of true quiet bravery. 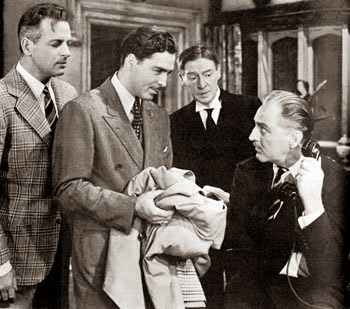 John Sutton (A Yank in the R.A.F., Captain from Castille) is uncredited as a Scotland Yard's Inspector or assistant in five of the seven movies. In 1939s Arrest Bulldog Drummond Leonard Mudie (The Mummy, Kidnapped) is an electrical engineer who has invented a ray that destroys ammunition. The crackpot inventor believes he has found a way to stop war and shows his creation to one he believes to be in sympathy with the cause. The interested party turns out to be the great George Zucco (The Adventures of Sherlock Holmes, The Mummy's Hand) sporting coke bottle lenses and a poisoned dart in his walking stick. Lights go out, bodies are discovered and things start exploding all over London on the night of Hugh's bachelor dinner. Drummond is right in the middle of things. Why is he always there when a body turns up? He'll be the death of Colonel Nielson and Phyllis is definitely not going to be happy. We can see Tenny ageing before our eyes. 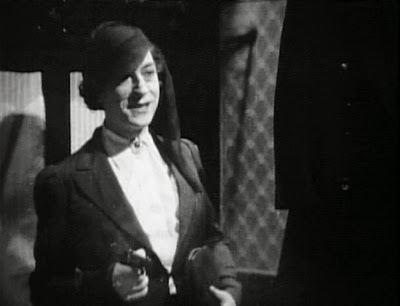 H.C. McNeile's The Final Count was the basis for this instalment adapted by Stuart Palmer, creator of Hildegarde Withers. James P. Hogan, director of four of the Drummond flicks, was in charge on this story and, like each of the series, it moves along briskly so you don't have time to stop and think about things too deeply. You shouldn't be thinking. You should just be enjoying the solid entertainment. We go from murky London nights to sunny Caribbean days following thrill-seeking aristocrats and greedy mercenaries. These spy types never do anything by halves. The world is always in danger from crackpot inventors and George Zucco. We are lucky that there's always a Bulldog Drummond and his pals and gals around to save us. When I saw my first Bulldog Drummond film as an adult, I was prejudiced against everyone who wasn't ronald Colman. Colman, besides being in my top three actors (With William Powell and Basil Rathbone), has all the style in the world! It took a minor leap of faith to give the others a shot, and I'm glad I did! I haven't met a BD that I didn't like, and that includes the radio versions! Thanks for highlighting this great selection...I may have to watch it for my Sunday nighter! I understand the Colman prejudice completely. It's hard for anyone else to measure up to that perfection. It is equally hard to resist the others who have taken a crack at Capt. Drummond and give it their all. I bought one of those 1000 old mysteries in shape collections and couldn't have been more tickled to find a bunch of "Bulldog Drummonds" among them as they don't air on TV they way they once did. I have that same collection. :) Those are good when you have the flu and you need 100 private eyes/cowboys/Roman Gladiators to take your mind off of blowing your nose, hahaha. "I'd love to get a complete remastered set of those Drummond goodies...." So many dreams. Will they ever come true? Frank Puglia - what a guy won't do for his art! I kept rubbing my eyes and shaking my head the first time I saw that movie. I watched two Bulldog Drummond movies: the one with Colman and Arrest Bulldog Drummond. 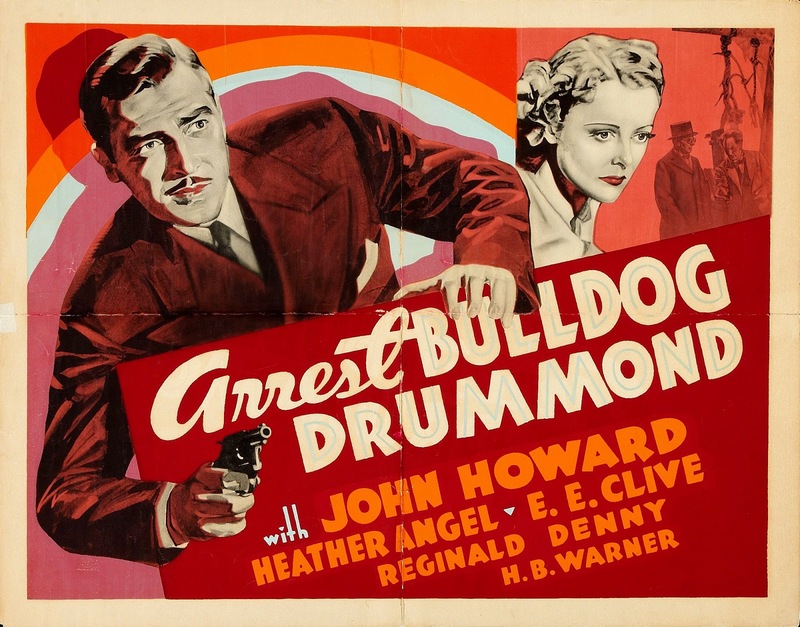 I think Colman's Bulldog had a great debonair actitud that lacked in John Howard's, even though Arrest Bulldog Drummond is a better and most thirlling movie. Now I need to see the one with Ray Milland! Honestly I don't think there are many things more cute than young Ray Milland. He is quite the rascal as Bulldog Drummond. My word, Drummond has certainly had a wild ride through cinema history, hasn't he? Thanks so much for sharing his history and the assorted actors who made their way through the series. Great stuff! A pleasure to have you for the event. There's even more! Ron Randall, Tom Conway, Walter Pidgeon and Richard Johnson all played Drummond in movies through to the 1960s. I wonder if there will be a 21st century Hugh. Thanks. I think it is pretty clear that without "Bulldog" Drummond we wouldn't have a James Bond. I haven't seen any of these movies--shame on me! Thanks for such a fun post, and for encouraging me to get my act together and watch these films! They ask nothing of you but to sit back and have a good time. Sometimes that is just what we need. Seven films in two years! These sound like fun...I just recently found out about Bulldog Drummond, the Richard Johnson version which I'll be watching soon. I'll try to track down the others you discussed...cool review, Patricia! Thanks a lot. The series seems to get lost among all of the others the studios gave us in those days. I have enjoyed every Bulldog Drummond movie that I have seen, for one reason or another. None of the series Drummonds could top Ronald Coleman, but each brought interesting things to the part. Thanks for sharing this with us. Colman is indeed hard to top, but the character is quite appealing. I clearly need more Bulldog Drummond in my diet. I'm sure Howard will win you over as Bulldog Drummond, and it will make his work in "The Philadelphia Story" that much better. Most of the BULLDOG DRUMMOND films are entertaining (well, except for that second one with Richard Johnson). I think Ronald Colman's second film is my fave, but the Howard film series was a lot of fun for all the reasons you highlighted (e.g., J. Barrymore in disguise). Indeed, they are "cozy!" They don't show up on TV as often as they once did. I think I'll sit around and complain like an old person! I first saw the Bulldog Drummond films on TV, on Saturday afternoons in Ireland, when I was a kid. The Howard movies were the ones shown and I loved them - Howard's other more serious roles were unknown to me at the time - largely because of the cast. That central trio of Denny, Clive and Howard was perfect. I still get a kind of warm glow just thinking about them. "I still get a kind of warm glow just thinking about them." I'm with you on that. It's like running into old friends. Old friends who won't change.